The Associated Press reported Wednesday that the Canadian government is sending “about 100” soldiers to assist police and border guards at the remote road on the Quebec-New York border that has become the nexus of an outpouring of illegal aliens living in America. 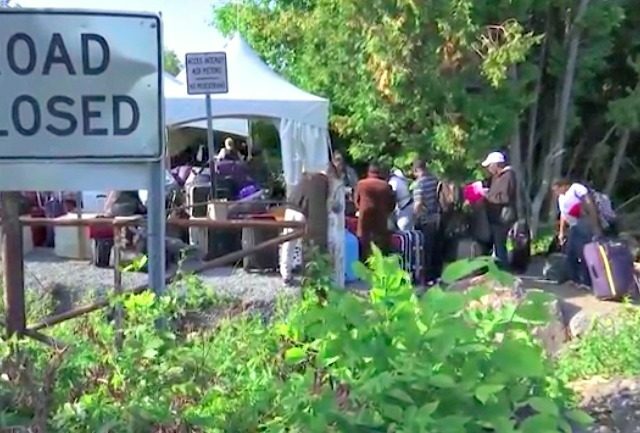 The back road crossing, with no official border post, near Champlain, New York, and Saint-Bernard-de-Lacolle, Quebec, has seen thousands of people, mostly Haitians residing in the United States, come by taxi and other conveyences to try to illegally enter Canada. Typically, the outflow is reported as resulting from “fear” of the climate created for illegals in the United States. Haitians in particular may be agitated because the “temporary protective status” (TPS) many of them were granted in the aftermath of that country’s devastating 2011 earthquake may be coming to an end. The status, granted by the Department of Homeland Security to specific groups of people suffering from war or natural disaster, has been extended time and again over the last seven years from its original six-month grant. TPS was never meant to grant the Haitians covered by it permanent residence in the United States, and they were expected to return to Haiti when the disaster had passed. In May, then-DHS Secretary John Kelly announced TPS for Haitians would be extended one more time, until January 2018, with a strong indication that this will be the final extension. The Haitians now illegally entering Canada hope to avoid going back to their home country after the end of their special protection. Others, including Africans in America on tourist visas, are trying to find permanent homes in Canada under the same asylum seeker system loophole. If they crossed at an official border post, their claim would be adjudicated immediately, but since they cross at this back road, they can stay in Canada while their applications pend. More than 5,000 people have taken advantage so far. Canadian officials told the AP they estimated 400 illegals crossed the border at the Saint-Bernard-de-Lacolle this Sunday alone. The flood is beginning to overwhelm the resources devoted to the problem so far, with Montreal’s iconic Olympic Stadium already being transformed into a refugee center to handle the influx. The soldiers from the Canadian Forces have deployed to assist the Royal Canadian Mounted Police and the Canada Border Services Agency. According to the AP report, the soldiers are there to set up a more permanent border crossing, including a tent camp for up to 500 migrants who are being arrested as soon as they set foot on Canadian soil. The migrants hope is to gain legal status through the relatively forgiving Canadian asylum laws.